A reminder of how the English countryside in days gone by. Wildflower meadows and woodland surround the Folly Farm Centre at the heart of Folly Farm, a 250-acre nature reserve between Bath and Bristol which offers spectacular views over Chew Valley Lake and the Mendips. The wildflower meadows at Folly Farm are now of a type now rare in Britain, with 97% of the UK's wildflower meadows lost since the 1930s. The meadows are unspoilt by pesticides and fertilisers, so they are brimming with flowers such as betony, ox-eye daisy and heath spotted orchid in summer. In late summer, they are covered with drifts of black knapweed and devil's-bit scabious which attract butterflies such as ringlet, small tortoiseshell, gatekeeper and marbled white. 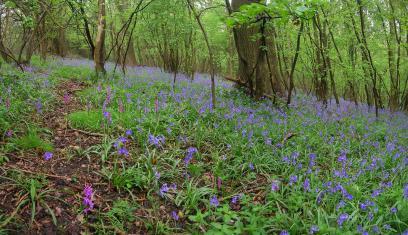 The woodland floor of and Dowling's Wood is extremely rich in springtime flowers, such as primrose, native English bluebells and early purple orchid. An extensive badger sett can be seen from the Access for All path in the woodland. Look out for nuthatch, buzzard and great spotted woodpecker. Tawny owls also nest and roost on the farm. The wildflower meadows and Dowlings Wood are Sites of Special Scientific Interest (SSSI). Avon Wildlife Trust has owned and managed the 250-acre nature reserve since 1986. A historic-landscape survey of Folly Farm in 1992 revealed that the site was once a medieval deer park, and there are notable remnants of a 1780s ferme ornée, with much planting surviving from the 1820s. A ferme ornée was a farm made for enjoyment as part of a large estate - in this case, Sutton Court. It would possess features such as paths laid along field boundaries, watercourses with cascades and pools and ornamental gullies. Elements of the ferme ornée are still visible today, and many of the features have now been restored. Avon Wildlife Trust successfully restored the unspoiled 18th century Folly Farm buildings to create a sustainable education and event venue - Folly Farm Centre. Folly Farm Centre provides a a beautiful inspiring venue in the heart of the 250-acre nature reserve for school trips, meetings, weddings and group accommodation. As well as being a memorable place for your event and a Green Tourism accredited sustainable venue, all profits from Folly Farm Centre are gift-aided to Avon Wildlife, to protect wildlife and inspire people about the importance and benefits of nature. Public footpaths access the whole reserve. Some pathways are on hillsides and can be muddy when wet. Access for all trail allows access for wheelchairs and pushchairs. There are a variety of walking options avaliable within grassland and woodland and nature reserve guides at information boards. Access for all trails allow access for wheelchairs and pushchairs. There are a varity of walking options avaliable within grassland and woodland. Some paths are on hill sides so can be slippery and muddy.